1. Preheat oven to 325°. Combine flour and salt in a medium saucepan. Gradually stir in milk, sweetened condensed milk, and yolks, and cook over medium heat, stirring constantly, 8 to 10 minutes or until thickened. Remove from heat; stir in vanilla. 2. Layer 3 banana slices, 3 1/2 Tbsp. pudding, and 3 vanilla wafers in each of 8 (1-cup) ramekins or ovenproof glass dishes. 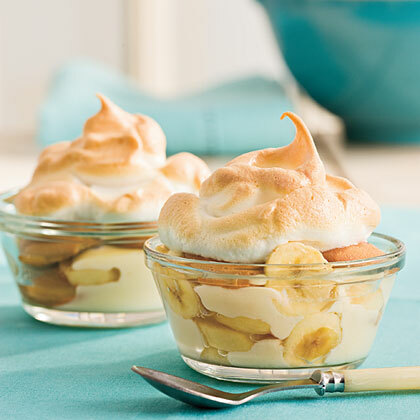 Top each with 6 banana slices, 3 1/2 Tbsp. pudding, and 3 vanilla wafers. 3. Beat egg whites at high speed with an electric mixer until foamy. Add sugar, 1 Tbsp. at a time, beating until stiff peaks form and sugar dissolves (2 to 4 minutes). Spread about 1/2 cup meringue over each pudding. 4. Bake at 325° for 15 to 20 minutes or until golden. Let cool 30 minutes.